The more our American social norms change, the more the military will reflect society. 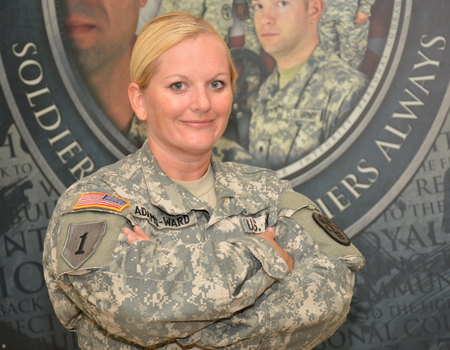 And today, there’s no shortage of women like Army Staff Sergeant Jennifer Adams-Ward, a combat medic from Fort Dodge, Iowa, who deployed to Bosnia once and Afghanistan twice during her 18-year career. On her first Afghanistan deployment in 2008, Adams-Ward worked directly with critical cases coming off the front lines. In 2011, during her second deployment to Kandahar, her mission was to build a Warrior Recovery Center (WRC) to provide assistance to those with traumatic brain injuries, as well as offering behavioral care and chaplain services. Now, back home, she is the medical noncommissioned officer of the Warrior Transition Unit at Fort Hood, Texas, and she couldn’t be more proud of her brothers and sisters in arms for their professionalism and service. Adams-Ward, who also holds a collateral billet as the equal opportunity officer, said service in the military should have little to do with gender. –Joseph Andrew Lee is a USO multimedia journalist.